I forgot about Mardi Gras. Could it be because I live in Montana? Yes. So, I did not plan any special recipes. I thought about making Beignets, but my love for fried dough will have to wait until I have a little more free time. Let's revisit a couple recipes that could help you get into your Mardi Gras spirit in a pinch! Thanks again to Heather for these little pieces of sunshine. I guess if I were at Mardi Gras I would be eating a lot of shrimp. I'm pretty sure that a lot of hard alcohol is involved in Mardi Gras. 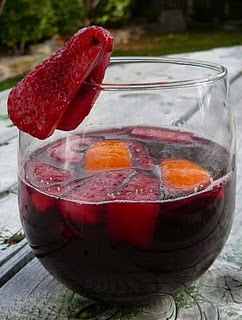 However, if I were there, I would rather be drinking Sangria.